Allows for side loading of lifting shackle up to 900. The rated lift capacity is lowered as the angle of the pull increases (see figure 1). Capable of turning a single steel plate from horizontal to vertical to horizontal through a 1800 arc. Lock open to facilitate loading and unloading clamp. Lock close onto material for a more secure lift. Enables user to open the clamp from a distance when the load is at rest and secured. Grippers are rated to lift material with a surface hardness up to 420 Brinell. 2 through 12 ton lift capacities have dual gripping cams and a self-aligning gripping pad. Also available with stainless grippers. Working parts remain inside the body in the “locked close” position and the “locked open” position. Protects parts for longer use. 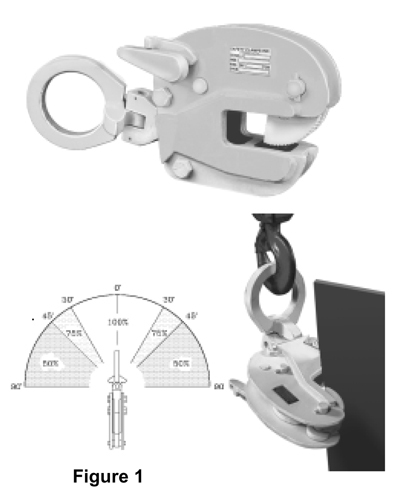 The Universal Shackle permits side loading of the lifting shackle at 100 percent of rated capacity from vertical to 30 degrees, 75 percent of rated capacity between 30 and 45 degrees, and 50 percent of rated capacity between 45 and 90 degrees.